Thigh (quadricep) injuries are quite common in running and jumping activities as well as in contact sports. Thigh (quadricep) injuries may be seen as quadricep strains and cork injuries. What is a quadricep muscle strain? A quadriceps muscle strain refers to a tear in the large muscle group which covers the front of the thigh. 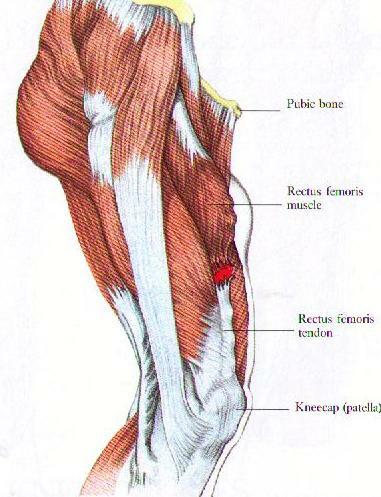 The quadricep muscle group comprises of four muscles which act to extend (straighten) the knee and flex (bend) the hip. What causes quadricep muscle strain? How does quadricep muscle strain feel? The initial sensation you feel is a sudden pain in the front of the thigh as damage to muscle fibres occurs. Often a ‘tearing sensation’ occurs. As the muscle cools down following activity, pain may gradually increase as bleeding and swelling around the injured muscle continues. Gradual tightening and stiffening of the quadriceps muscle occurs in more severe strains. These sensations may be exaggerated such that you are unable to continue participating due to excessive pain in the thigh, muscle tightness, weakness and spasm. Management of quadricep muscle strain and how to fix it? You should stop your activity immediately and start initial treatment. Treatment should preferably occur in the first 24-48 hours to control the amount of swelling and limit the degree of damage to the muscle. The RICE protocol should be commenced (Rest, Ice, Compression and Elevation) to reduce blood flow to the injured area, thereby, reducing the extent of swelling and tissue damage. You should continue the RICE regime until you consult a sports medicine professional, preferable within 2 days of the initial injury. The assistance of a sports medicine professional is important in the treatment of a quadricep muscle strain. Initially they can assist in determining the reason for and the extent of the injury and how long it is expected to recover. Management will involve appropriate techniques to assist in reducing pain and swelling and enhance the healing of the injured structures, including a progression of exercises aimed at increasing your range of motion, strength and function. As these exercises are functionally specific to your return activity, they will help prevent reinjury. What is a quadricep contusion? A cork thigh refers to damage to and resultant bleeding (hemorrhage) within and around the quadricep muscle group. This thigh (quadricep) injury is more commonly seen in contact sports due to collision. What causes a quadricep contusion? Impact from a direct blow to the thigh as a result of being struck by an object or collision with another player. It can also be a crush injury as it is compressed against the underlying bone. This causes damage to the muscle fibers and blood vessels contained within the muscle, resulting in bleeding and swelling of the muscle. How does a quadricep contusion feel? Cork thigh pains often a dull ache and normally sharp pain is felt when activating the muscle in the more acute stage. In mild contusions this pain may initially settle, allowing you to continue participation. As the muscle cools down after activity, the pain may gradually increase as bleeding and swelling within and around the muscle continues. This may be associated with progressive tightening and stiffening of the quadriceps as the small compartments within the muscle become filled with blood. Obvious increase in size of the thigh due to swelling and bleeding. calcification of the haematoma (myositis ossificans). With a first-time injury, proper care and sufficient healing time before resuming activity should prevent permanent disability. The average healing times are from 2 – 10 days with a minor to moderate contusion, and up to 6 weeks for significant contusions.